On Wednesday, September 27, at 13:28 UTC AS9299, belonging to the largest ISP at the Philippines - Philippine Long Distance Telephone Company (PLDT), leaked prefixes between several Tier-1 operators (TATA, Cogent, Telecom Italia, PCCW) and AS1273, owned by Vodafone Europe. As a result traffic from more than 2000 prefixes in USA, India, and Philippines was redirected to Asia region. An active phase of this anomaly lasted for more than 2 hours. 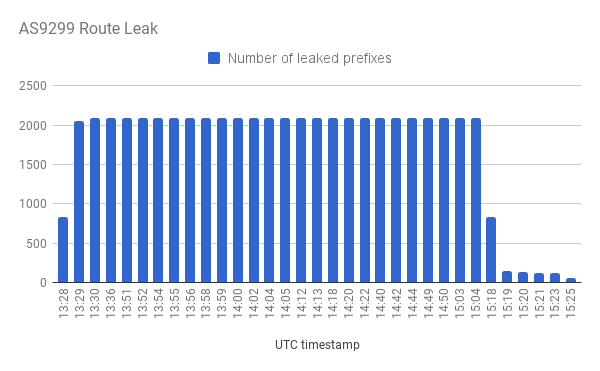 A prominent feature of this route leak was significant (up to 300ms) latency raise for Vodafone users and its European Ip-transit customers. As an example, network 138.108.11.0/24, which belongs to AT&T (AS7018), experienced latency of circa 300ms instead of usual 80ms, as traffic originating in Europe traveled through Hong Kong, further to the Philippines and only after to the U.S. through the west coast. This particular example shows that not all route leaks necessarily end up with inaccessibility, though could result in unacceptable growth of the network latency for online services.